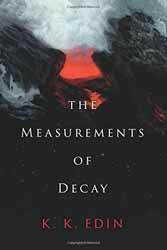 The Measurement of Decay (2018. 576 pages) is a philosophical science fiction novel from K. K. Edin. The story revolves around three people at three separate points in time. Tiken Solstafir is in self-imposed exile on the spaceship Equuleus. In this far future much of humanity have fled reality through the use of the ‘procrustiis’ a chip-like structure, implanted into their brains which allows them to live much of their lives in a virtual reality of their choice. Zombie-like in their self-imposed hallucinations only Tiken is aware that the ship has been boarded by black suited beings on the hunt for a particular individual. As they kill all of those on board, Tiken and his friend Naim try to make it to the cockpit where he is certain they can gas the invaders and put both the crew and passengers to sleep, thereby saving everybody’s lives. When they reach their destination they join up with the pilot Mira, who informs them that the gas does not sedate, it kills. Looking for revenge for the boarding Naim and Mira want to release the gas but Tiken stops them, not wanting to be responsible for killing everybody on board even though he knows they will certainly die anyway. Sielle is an enigmatic young Russian woman who through stress and danger is able to travel in both time and space. As she grows older she starts to be able to gain control over her abilities. In contemporary Paris a young, unnamed, philosopher struggles to finish his opus major. The work has already alienated him from his partner and further alienated him from his only friend in Paris. His obsession with his work sees him spiral down into poverty, declining to attend to the needs of his body; he pursues his goal with no real idea on how he can accomplish this. I cannot pretend that this is an easy book to read. The use of language is sometimes dense as are the concepts. I do not think that the author means to place a barrier between the book's ideas and the audience; rather it seems as if the language is being used to slow the reader down, thereby making sure that they can grasp the complexities of the story. The novel shifts between the perspectives of the three main characters, although sometimes this felt like it was difficult to invest in one character before quickly moving onto the next. My own preference would have been to spend a little more time with each individual before moving onto the next. The storyline of both Tiken and Sielle were compelling as they were interesting characters. On the other hand I could have quite happily strangled the self-obsessed, navel gazing, unnamed philosopher. I’m not sure why Edin felt he needed a character that was so thoroughly unlikable. Overall, this is a book which dares to be different and challenges the reader to work a little harder to understand the underlying thoughts and ideas. I could imagine the language choice and density may put the casual reader off, but I would encourage anyone to persevere as once past the first five or six short chapters this book will have you gripped.